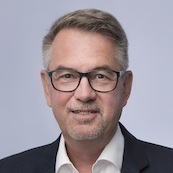 As Head of the German Sales Division for Vacuum Conveying and Ergonomic Handling , Johannes Krumme has more than 25 years of extensive experience in mechanical engineering, production and vacuum technology. Prior to Piab he held several positions as Operations and Sales Manager at various blue-chip companies active in compressed air and vacuum technology in the areas of metal handling and vacuum solutions. He holds a degree in in mechanical engineering from the University of Applied Science, Dortmund, Germany.